This event is for the bride specifically looking for an intimate bridal appointment to share with her closest friends and family! These occasions are booked by special request and are held on Sundays, Mondays or during off-hours while the salon is closed to the public. Your time with us isn't as limited as the allotment for an appointment during the week or weekend. You and your guests will be served Champagne and Hors d’oeuvres while you enjoy this once in a lifetime experience! The booking fee for this appointment is $100. We will credit the fee (along with any other available incentives) towards your gown payment if you make the purchase on the day of the appointment. Call us to schedule your appointment! One of our lovely new brides Kristie being greeted by one of our stylists, with a glass of champagne! Kristie was very nervous to try on wedding gowns for the first time but the warm welcome put Kristie's mind at ease! She was ready to shop but first she had to meet her personally assigned stylist! Kristie had so many ideas, pictures and visions but she didn't know how to translate them into words! 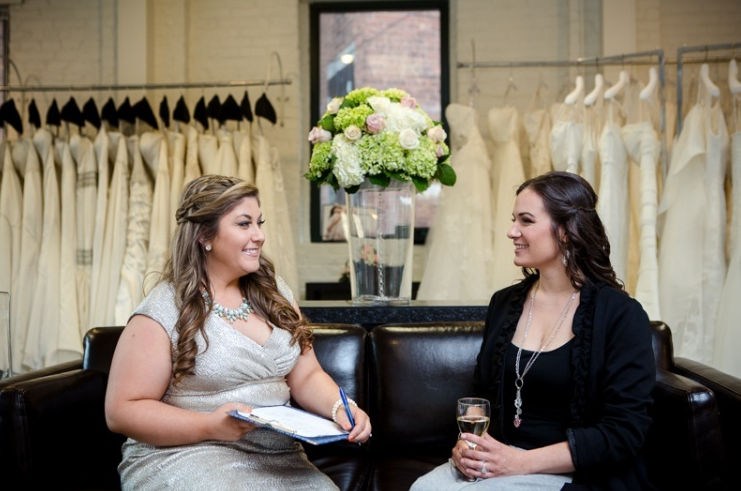 Our best stylist consulted with Kristie to first find out what her personality represents and helped her determine how to select a gown that not only represents her inner beauty but also compliments her figure and style. They decided to select a few different silhouettes, fabrics, and designers. Kristie was a very particular bride so we brought in one of our associates, to show her a few new arrivals from the Matthew Christopher Collection! With so many gowns to choose from, our stylist showed Kristie some with beading, lace, and gowns that varied in silhouettes! Kristie loved the idea of a ball gown but was open to trying on a trumpet style! She still wasn't sure what she was going to fall in love with, she always pictured a beaded ball gown but as we say expect the unexpected! After narrowing it down to a few dresses with the help of our stylist, Kristie came across a beautiful Matthew Christopher Venetian Lace Ball gown! She loved everything about it so our stylist began to put the entire look together to really show her a complete bridal look! Kristie still felt like something was missing, the type of gown she had always pictured herself in may not have been the one, there were so many new styles she never thought of herself in that were now in the forefront of her favorites! This is when brides start to get nervous and once again, our stylist came into the appointment to encourage her to try on a brand new gown by Matthew based on the structure and lace patterns she was drawn to. Our stylist shows Kristie the "Sophia" gown by Matthew Christopher and it was love at first sight! Kristie said she could never imagine finding a more unique yet stunning, and classic gown! It was great to have to everyone from the Bridal Trousseau help to bring this bride to her final stop on this journey of choosing the dress of her dreams! One of our associates, is assisting Kristie with her first alterations appointment. She along with our stylist, like to lend a hand during your purchasing experience so that we are ready and able to answer any questions you may have and ease any and all anxieties! Kristie found that the "Sophia" Gown by Matthew Christopher embodied everything she was looking for! Classic lace, form fitting and flattering yet fashion forward and unique! We topped off the look with a gorgeous veil by Sara Gabriel Couture and Kristie's vision came to life!